Columbus made his way to Grenada in 1498, but foolishly didn’t hang around! It remained uncolonised until the French arrived in the 17th century to set up sugar plantations, they brought African slaves along with them. In 1762 Britain seized Grenada and continued sugar production until the 1800s when cacao became the main export - followed by nutmeg in the 1900s. All this, along with fertile soil and fresh water, earned Grenada the title of, “Spice Island.” When slavery was abolished, large numbers of indentured servants were imported from India to work on plantations. The result is an interesting mix of culture that gives Grenada a distinct feel. French, British, African and Indian influences can all be seen in language, cuisine and dance. Many Grenadians of African descent maintain knowledge of their tribal history, something unusual in the Caribbean. Grenada was granted independence in 1974. In 1983 the island was briefly seized by a Marxist military council, but order was restored less than a week later when the US, along with six island nations, invaded and captured the ringleaders, restoring democracy. The event is referred to by Grenadians as “The Intervention” and is celebrated during Thanksgiving in October. The island’s rainforests are nearly as popular as its beaches, and there’s no shortage of annual festivities to take part in. Yachters or ‘Yachties’ have been visiting Grenada for decades, and the island is a frequent spot to make a stop and take on crew or passengers. 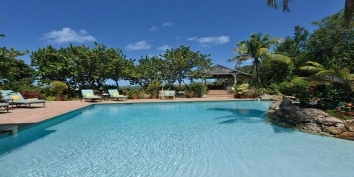 To find Grenada villa rentals by owner, for your next holiday, simply select Grenada as the destination in the “BROWSE BY” tool bar towards the top of the page. If you have set vacation dates use the “AVAILABILITY SEARCH” box, which blends in/out to the right of the slideshow. 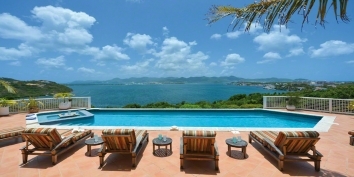 Alternatively, you can simply browse through the following list of Grenada villa rentals by owner. The Mount Edgecombe Plantation nestles above the Caribbean Sea on the West Coast of the spice and cocoa rich island of Grenada in the West Indies and offers an absolutely unique, stunning, yet serene, barefoot luxury vacation experience. This Grenada luxury villa rental offers spacious accommodations and very personal service for up to 16 guests in 8 beautiful bedrooms. The jaw dropping double infinity swimming pools and sun decks just have to be seen to be believed. Find out more about Mount Edgecombe Plantation, St. Mark’s, Grenada. A unique and highly desirable residence of spacious proportions, Azzurra Castle encompasses a 26,500 sqft site set at the end of a peninsula, Lance aux Epines, on the south coast of Grenada overlooking the Caribbean Sea. An amazing house of great substance and character, beautifully designed for Caribbean living, Azzurra Castle comprises; one private gated landscaped entrance courtyard with garage and parking, several extensive living and dining areas, roof and garden terraces, patios and beautifully managed tropical gardens. 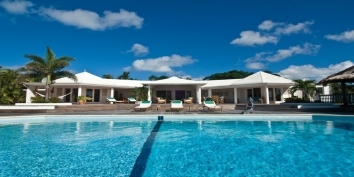 Find out more about Azzurra Castle, Lance Aux Epines, Grenada. Is your Grenada villa already unique on CARIBIQUE? 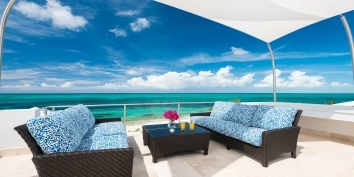 If not, find out how to list your Caribbean villa now!